François Villeroy de Galhau was born in Strasbourg on 24 February 1959 into an industrial family from the East of France with roots in Saarland. He studied at the Lycée Saint-Louis-de-Gonzague and graduated from the École Polytechnique (class of 1978) and the école Nationale d’Administration, (class of 1984 “Louise Michel”). He is also a former Inspector of Finance. From 1990 to 1993, he was European advisor to the Minister of Finance and Prime Minister Pierre Bérégovoy. He then held various posts at the French Treasury in Bercy, before becoming financial advisor at the Permanent Representation of France in Brussels. Under the government of Lionel Jospin, he was chief of staff of the Minister of the Economy and Finance, Dominique Strauss-Kahn from 1997 to 1999 and Christian Sautter from 1999 to 2000. He was head of the General Tax Directorate from 2000 to 2003. In 2003, he became the Chief Executive Officer of Cetelem, the consumer credit company of BNP Paribas group, then headed the group’s retail banking activities in France (2008). 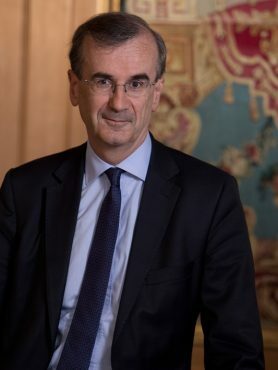 François Villeroy de Galhau served as Chief Operating Officer of BNP Paribas group, in charge of domestic markets then of corporate social responsibility, from 1 December 2011 until 1 May 2015, when the French government entrusted him with an assignment on investment financing. François Villeroy de Galhau was appointed Governor of the Banque de France by the President of the French Republic on 30 September 2015 and took office on 1 November 2015. He is a member of the Governing Council of the European Central Bank. He has notably published « 18 leçons sur la politique économique » (Seuil, 2003 and 2006) and « L’espérance d’un Européen » (Odile Jacob, 2014). L'éthique est-elle un frein économique ?